Mumbai seeing (almost) dry days. The city has seen only 34 mms and Scruz 23 mms in the last 10 days. That's a very Low figure for peak Monsoon 10 days ! The Monsoon axis having shifted North brought a "break Monsoon" condition to the city (and State). However, 2 systems from the Bay approached the Eastern coast, and the systems tacked through Central India. The Western end of the Monsoon Axis remained in the far North, almost over Punjab. Hence this prevented the West coast off shore trough from getting activated. As explained several times, the seasonal Low of the axis must slide South, almost over Kutch to create a proper strong off shore trough along the west coast. I do not see any dramatic change in the situation. In fact the axis and upper level winds do not seems favourable for meaningful Monsoon revival along Maharashtra Coast next 8 days. After Wednesday 24th, Axis is "cuddled" in the Himalayan Foothills ! Mumbai will be getting warmer, with stuffy nights. Tuesday may see some showers, but thereafter Partly cloudy skies with few passing showers ( 5-7 mms at the most per day). This may be the scene till 30th August. Maharashtra interior will also see low rainfall till this month end.Days getting hotter. Gujarat already in the deficit, may get scanty rains after Tuesday. What a scenario. No rains for Mumbai and people in mp are asking for monsoon break. Natures way of teaching lessons. Really unable to understand reason for this elongated break. So is there a dramatic increase in situation after 30 August? Hope it is else we staring at third deficit monsoon. What's is your opinion sir. akshay: We will see a monsoon recovery in first week of Sept. For Mumbai, we may resume the wet spell with thundery developments. But, i feel overall the monsoon may not be deficit. Sir, can you say the same for Gujarat? The whole of August till date has been a bit down compared to the forecast. 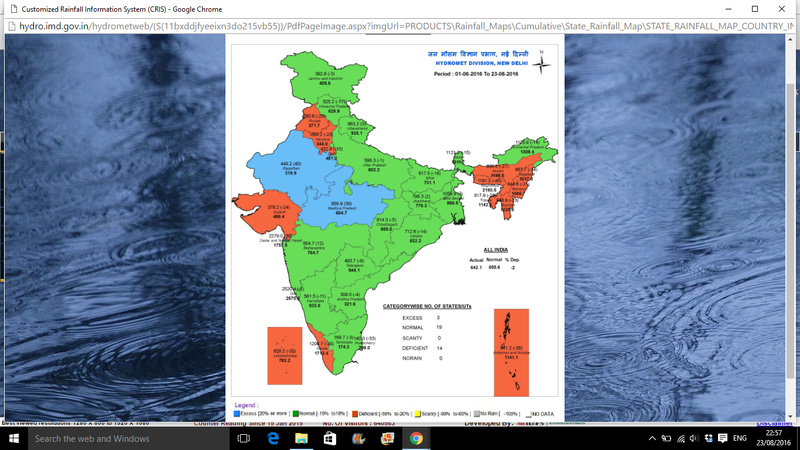 August rainfall till date (22 Aug) is about 6% down on normal. However, this belies the distribution of rainfall. The belt running from Gangetic WB, through Jharkhand and MP, then into Rajasthan, Madhya Maharashtra and Saurashtra with an area of 1.03 million sq km has received rainfall far in excess of normal (+56%) till date in August. The rest of the country with an area of 2.25 million sq km has a deficit of 30% till date in August. South Peninsula has a deficit of 60% in till date August. Even Cherrapunji has had only 500mm of rain in the past 4 weeks - deficit of more than 70%. Sir when is the monsoon going to withdraw this year,will it extend uptil october first week? Rajesh sir,good intermittent rains in nagothane(roha) since yesterday.happy to see rains as of july pattern.Very heavy rains were recorded today morning ? What is your forecast for this region in month of september.Hope you would answer it without neglecting!! Yes except central India area of mp, east Rajasthan, jharkhand, Bengal, entire country seems to be in deficit in August. In fact I have noticed that August is becoming very similar since last 3-4 years atleast for Mumbai. Elongated break monsoon conditions. Typical August rains have disappeared in Maharashtra state. Hope the scenario turns around sooner rather than later and monsoon rebounds with full fury. Hope monsoon expands well beyond September for covering all shortfall. arjun: Yes, I had mentioned showers for Mumbai on Tuesday. We had several showers and few heavy in the day. Which part of Mumbai are you from ? But as mentioned , seeing decrease in rains soon. abizer: I have made it very clear that i will not publish long term forecast. specially a forecast for one month. I had mentioned Konkan rains till Wednesday. And note: I do not neglect any comments ! Samanth Vohra: Please indicate to which region you are referring to >..I do not know your location. As you know, Monsoon withdrawal starts from Rajasthan normally in early september and can go on for a month. Navi Mumbai heavy rains entire night. If we have low/UAC over GUJ + west coast trough then MAHA will have extreme rains (as seen for past 2 months.) It is very rare to see axis over north but lows bay crossing MP/RAJ/GUJ giving torrential rains. Southern India is going through bad phase- as per economic times August deficit is more than -60%. Prices of coffee,tea,spices will shot up. All eyes on sky. Actually 2015 august was similar - break period this happens every year. Hrishikesh: Generally i do not give long term forecast...though for my own working i am always working on LTF , but do not publish it. LTF generally varies and cannot be constant. Hence i have my own working ready, but not published. For your knowledge, i see poor rains in Mumbai till 31st Aug. A system or UAC from the east will bring enhanced rains to Mumbai around 3rd Sept.Thunder showers in Mumbai early Sept.
SWM withdrawal from West Rajasthan also on cards in 1st week Sept.
Imd downgrades monsoon forecast to normal from excess as stated in its earlier versions. This year's break monsoon is atypical and long it seems. almost three weeks of scanty rainfall in Mumbai & North Konkan. Weak or non existent offshore trough coupled with Negative IOD means Arabian sea is sleeping. Bay of Bengal unable to take entire load it seems. Is it a chance that monsoon withdrawal is delayed and we get good September closure rains? Are West India (Maharashtra & Gujarat) and South Peninsula (Kerala & Karnataka) staring at a deficit? As predicted by Vageries Rajesh sir -> Mumbai is having gorgeous sunshine after 3 months! All hills glistening with dense green trees. On Janmasthami may Lord Krishna/Vishnu bless entire country with bountiful rains. Dear Sir,I belongs to Erode district of TN. I am following this blog for past three years. As a person from agricultural background,worried about Cauvery and Bhavani. Especially in Nilgiris we don't see good rain this season. Reservoirs are are with very low. Can we expect good rain in coming days in catchment areas of Bhavani? Your views may be useful for our farming decisions. Is there a way to explain as to why we are now 3% in deficit in contrast to early predictions of 6% surplus. More than anything no one in the beginning of Aug seem to have had an inkling that the southern peninsula will go bone dry in August. In fact one may say that this August is worse than the Aug of last 2 years where ElNino was very pronounced. why imd is always revised forecast during every month's last week?and forecasting during 1st week. what is lolz.it's comedy or trajedy? Good now we have active southern bloggers. Meanwhile Mumbai is having heavy rains entire day! Who knows RAJ and KER may reverse over years! Prabhakaran; As you know, the wettest region of kerala have been getting less rainfall this year. Instead of a dramatic improvement, i see a temporary increase in Kerala and Silent Valley regions rainfall from 28th. This, as we have a Low in the Central Bay. But, unfortunately, we may again see a reduced rainfall next week for Kerala hills. Madhava Krishna: I do not have a doctorate in this topic, but just a enthusiastic and experienced learner like everyone else. I have given my views in blog on Friday . A slight delay of 15 days in La Nina occurance, and a deficit of -3% has set everyone thinking , of the worst. But, let us wait and see, we have september coming, with good rains hopefully. Akshay/Jiva: Answered your doubts in blog article.